When a driver chooses to get behind the wheel and fails to act reasonably it is often considered negligence. One form of negligence is fatigued driving wherein a driver gets behind the wheel when he or she is sleep-deprived or simply too tired. Unfortunately, driving while fatigued is a common practice amongst many drivers, although most do not realize just how dangerous it is. A 2013 survey by the National Highway Traffic Safety Administration found that at least 1 in 24 drivers admits to falling asleep while behind the wheel. In fact, in South Carolina there were more than 730 traffic collisions caused by drowsy driving and approximately 1.5% of these were fatal collisions. 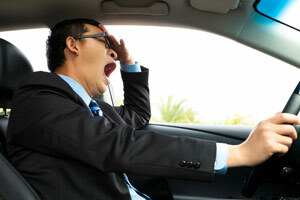 Driving while drowsy is a serious, yet preventable problem. Are you a victim? If you or a loved one has been injured in a car collision caused by a tired driver, did you know that the victim may be entitled to compensation for property damage, medical expenses, lost wages, and more? At the law offices of Harbin & Burnett, our auto accident lawyers have extensive knowledge of South Carolina's traffic laws and can help fight for the justice that you deserve. For a no-cost, no-obligation review of your accident claim, fill out the FREE CASE REVIEW form to your right or call us today at 1(888)821-0247. Most persons are aware of when they are too tired to drive and unfortunately most will turn to certain methods to try to stay awake. During this time a driver may quickly fall asleep behind the wheel and snap back to attention, this is commonly referred to as microsleep. Those who insist on using caffeine, rolling their windows down, or using other methods to stay awake are also endangering the lives of their fellow motorists. Such methods only mask how tired a person truly is and can lead to a crash while on the road. Along with understanding the signs of a tired driver, everyone should know how to prevent themselves from being involved in a drowsy driving accident. Some caffeine can help a driver stay alert, however it should not something that is consumed every hour in order to stay awake. Drivers should also recognize when other motorists may be fatigued while behind the wheel such as drifting out of their lane or seen nodding off. If you or a loved one was injured in accident with a fatigued driver and the victim is seeking legal counsel, our attorneys can help. You can also contact us online by filling out the FREE CASE REVIEW form at the top right hand corner of this page it is completely confidential.